A wise women once told me that every woman is gifted just the right amount of power she will need in her lifetime at birth, and that if she failed to use those powers they would be, in time, taken away from her. I often wonder if the women in my community have reached that point? Are we powerless to fix our own problems? Or, are we powerFUL and just fail to see our strength for what it really is? I prefer to believe the latter. Women and power is a taboo subject in America. I think that is because we are not men, and we do not possess the same powers that men possess. Does this mean we are unequally empowered or less powerful? Absolutely not. Our power is meant to complement the power or our brothers, in a way that is beautifully equal and wonderfully whole. 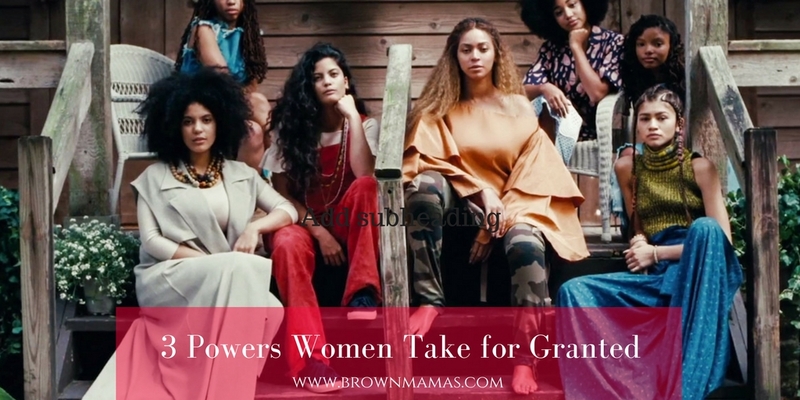 If you can get down with this, check out these 3 Female Powers that every Black woman possesses, but sometimes forgets. Do you know what you do to a man when he comes home to a clean house and some food that smells good. Excuse my french ladies, but when you do this you literally have got him by the balls. I implemented this act into my daily routine and let me tell you it is so much easier to get my husband to do what I want him to do when he knows that well-placed conversation about cutting the grass will be promptly followed up by a healthy, hearty meal. Often we think of power in terms of making millions of dollars or commanding an army of hundreds of loyal followers, rather than as the simple act of your power to have a good day, engage in positive and impactful conversations with the people you meet and be able to persuade others without controlling them. Power does not need to be loud, boastful or aggressive. Think about the simplicity of cooking a healthy meal. You determine the quality of life for your man and your children by the quality of the food you prepare in your home. You determine if your children will go to school with a content and conscious belly or high off of sugar. They don’t say, “Happy wife, Happy life,” for nothing. A woman’s power is secret, quiet and often a mystery to the very people it encounters. You are connected to your sisters in the same way the roots of each tree in a forest are entangled deep beneath the surface of the Earth. And, in that darkness there is strength, there is life-giving waters there are symbiotic, electrifying connections that have power to shake the very ground every man walks on when moved. Have you ever left a great conversation with girlfriends and felt like you could rule the conquer the world? Well then, you have felt the power of uploading the thoughts, feeling, attitudes and wisdom of another woman. Just like our relationship with our men, the relationships we build with our sistah friends should not be ones of competition, but of complimentarity. If you are not feeling fulfilled in your life right now it’s likely, in part, due to the lack of connection you have with other women. WE NEED EACH OTHER. We often take for granted that the upgrade we are seeking in life is likely in another woman waiting to be found. Like this article? Check me out on Periscope every Tuesday at 12 pm. Thanks for commenting Mrs. Day! YES. That’s all I have to say!